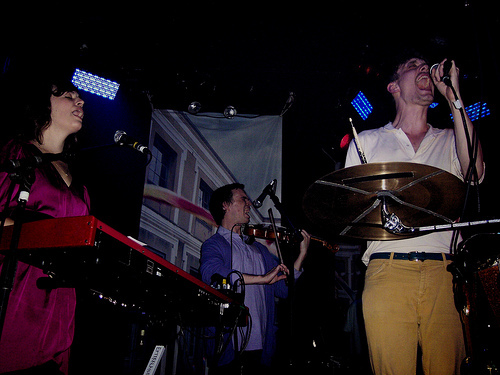 Efterklang wrapped up their North American tour with a couple of shows in New York this weekend, and the band’s stunning performance at Santos Party House in Manhattan on Friday left the audience completely enthralled. Lead singer Casper Clausen commented, “It’s great to be ending our tour in New York,” later toasting the audience with a beer. The band’s songs vary from indie-electronica to experimental folk, always with complex song structures, a multitude of instruments and beautiful vocal harmonies, and it all translates seamlessly to the stage. 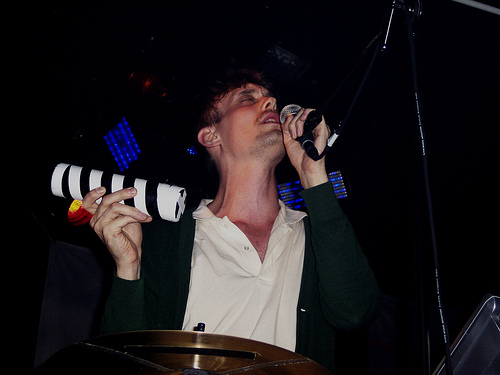 In addition to Clausen, Efterklang includes bassist Rasmus Stolberg, drummer/trumpeter Thomas Kirirath Husmer and programmer/keyboardist Mads Brauer. For this tour, the band, from Copenhagen, Denmark, has been performing as a 7-piece, with Heather Woods Broderick on additional keyboards and flute, Peter Broderick on violin and Daniel James (Canon Blue) on guitars. Kicking off with “Full Moon,” from the recent Magic Chairs (4AD), they followed up with “Alike” and “I Was Playing Drums,” the latter ending with a lovely violin solo. Much to the delight of earlier fans, Efterklang then played an old crowd pleaser, “Step Aside,” from the 2004 debut, Tripper and then went full throttle on “Caravan,” from the second album Parades (Leaf), rocking out with a swell of vocals and horns (trumpet and flute) and a wicked violin part. That segued nicely into a much softer and slower “The Soft Beating,” on which much of the audience was inspired to sing along. In the middle of it, Stolberg briefly walked off stage and into the crowd with a tambourine. And Clausen, when not playing additional percussion, often veered to the edge of the stage to engage with the audience. Also in the set were the recent hit “Modern Drift” and “Cutting Ice to Snow.” For the encore, Efterklang closed with another crowd favorite, “Chapter 6,” from Tripper, and again went all out, this time with special effect lighting as Peter Broderick climbed on a high stool to play drumsticks on one of the stage’s support beams. It was quite a show. On the bill as well were three very different Brooklyn-based bands. Buke and Gass, the charming duo of Arone Dyer and Aron Sanchez, who supported Efterklang on the entire tour, were captivating. 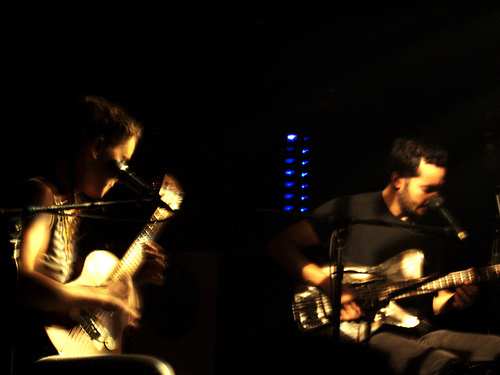 The band’s name comes from their instruments – a baritone ukulele (Buke) and a homemade guitar-bass hybrid (Gass), which Dyer and Sanchez supplemented with various foot-controlled percussion (bells, tambourine and drums), displaying excellent coordination skills while creating quite a big sound with all acoustic instruments. With her distinctive voice, Dyer sang lead on most of the edgy and at times twangy songs, which included “Bundletuck,” “Outt!” and the single “Medulla Oblongata,” while Sanchez chimed in with vocal harmonies. The second band, Xylos, also blend guitars and synthesizers but tend more on the indie-pop side of things. 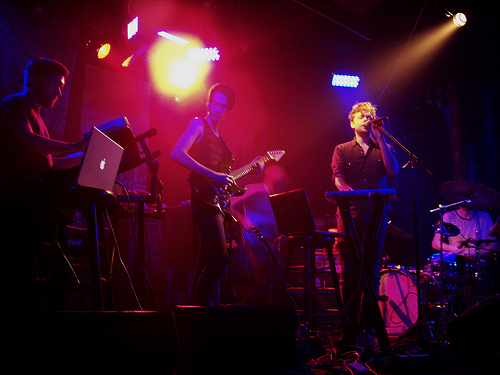 The band has revamped its sound since the first EP was released in 2008. 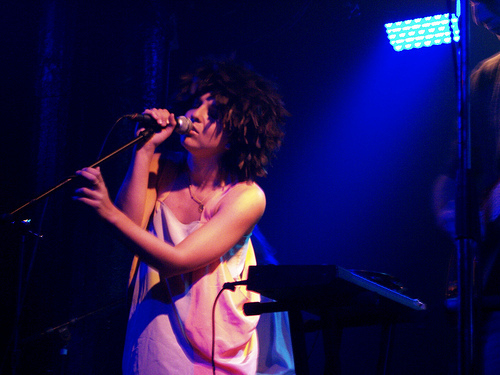 Fronted by lead singer Monika Heidemann and guitarist Eric Zeiler, the band’s songs had some catchy melodies and hooks as well as nice vocal harmonies. The set included the single “Not Enough,” “Mission,” “Blind Eye,” all from the forthcoming album.